Really love how your end items are mostly crafted. i don't understand how you have so much stats and energy factor... i spent 4 hours crafting with over 100 shrines each and didn't get stuff nearly close to your endgame gear. i only do 7.7k damage while you're hitting 19k. Also be a good item in place of a craft or the eternal vigil? the trinity nova proc works decently for that extra aoe dmg and +5 skills is always nice. i have this on my vesseldin on SP and it works nicely. Vigil ? Angirs Star as an endgame item ? what No...?!? The best endgame item for this build without question is probably this scepter Goedendag! 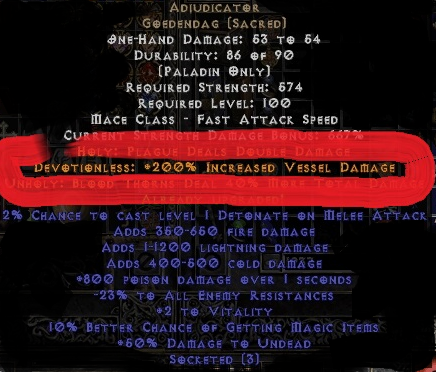 just look at that beauty simply doubles your vessel damage ! 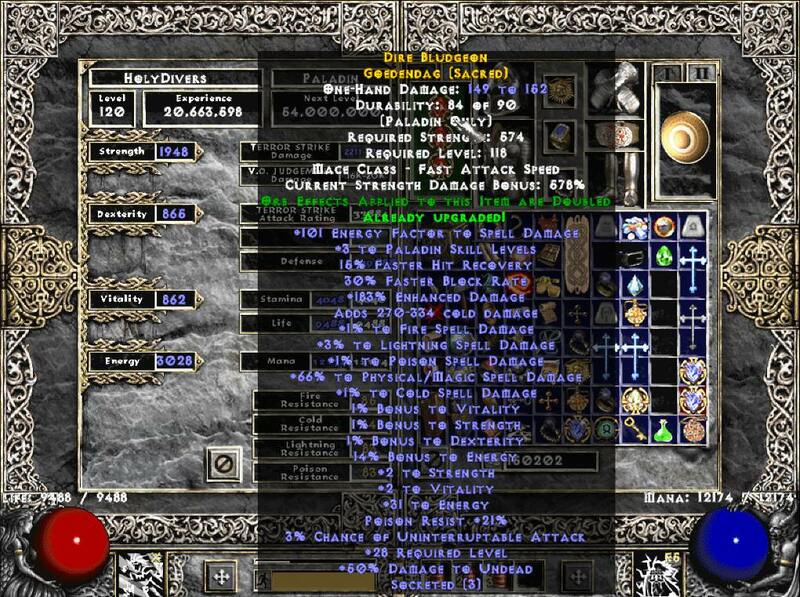 Back when I played Holy Melee pala I swapped to vessel build with my holy melee gear once and just by having this item equipped I could already clear TA slowly already imagine if I had dedicated crafts! surprisingly the proc goes off more than u think! which makes ur vessel ignore the physical resistance of undead skeletons in order for you to be able to farm Kurast 3000 B.A. Exorcism is a dot that deals magic damage and spreads to mobs like a plague! Now the main problem with going energy crafts I think is because if u don't feel Tanky enough for a certain Uber and respec to a bit of vitality your gonna lose a lot of damage! You might also wanna try Enchanted shrine crafts but I can see why u wanna use energy and energy factor because if u have any elemental procs in your gear its gonna increase the procs damage as well! MJA1521 wrote: i don't understand how you have so much stats and energy factor... i spent 4 hours crafting with over 100 shrines each and didn't get stuff nearly close to your endgame gear. i only do 7.7k damage while you're hitting 19k. Did you tried to bless your items ? 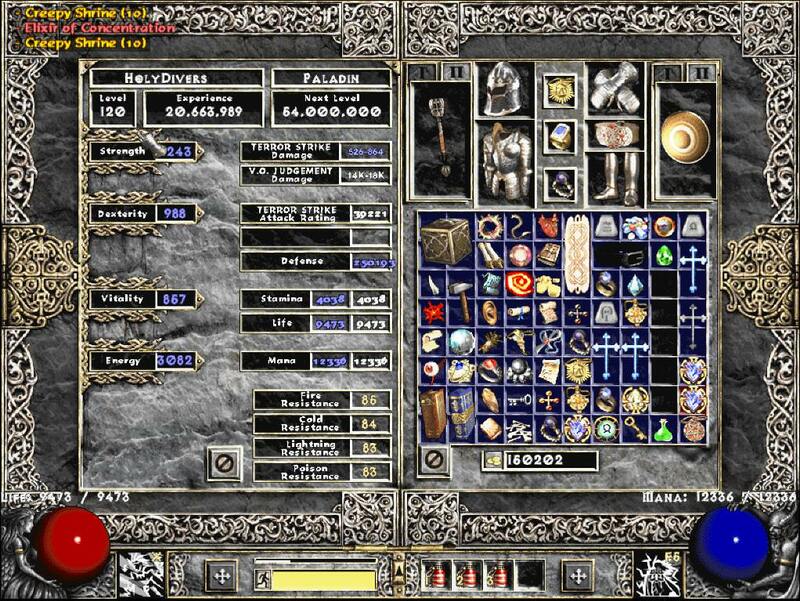 Battery wrote: Really love how your end items are mostly crafted. I just did LC1 as a vesseldin with mediocre gear, it’s definitely possible. Baal was the only annoying thing in hatred difficulty so far, I killed him with no deaths but I did have to use like 8 health pots while running circles around him. Nice guide, even if it's still WIP. Will you update it once Sigma is out with the revamped neutraldin tree? just look at that beauty simply doubles your vessel damage ! It doesn't double it, it triples it (it's +200% not +100%).